Cloud computing. Artificial intelligence. An aging workforce. The global economy. These are just some of the factors that are radically changing how we work. 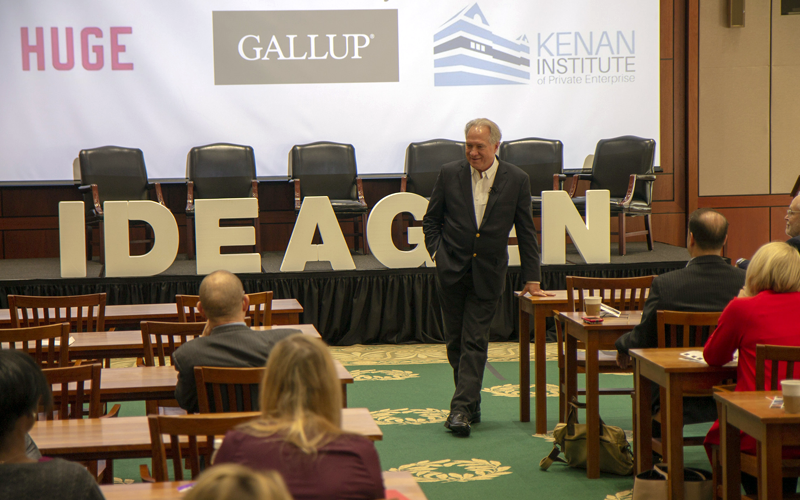 On Tuesday, Oct. 30, nearly 75 business, academic and public policy thought leaders discussed these considerations and more at the Ideagen 2030 – Future of Work Summit at Gallup world headquarters in Washington, D.C. The summit was sponsored by Gallup, the Frank Hawkins Kenan Institute of Private Enterprise and Huge, Inc. The day began with a challenge from George Sifakis, co-founder of Ideagen, an incubator for cross-sector innovation. Sifakis asked attendees to identify new solutions. Gallup CEO Jim Clifton followed with a presentation on innovation and entrepreneurship as the primary sources of productivity growth in the U.S. Clifton also opined that productivity growth is in jeopardy, in part, because millennials are not starting small companies at the same rate as previous generations. Justin Bibb, a senior consultant at Gallup, on the disparity of perceptions between young white and black urbanites in Sacramento around questions of inequality and opportunity. Andy Miller, senior vice president of innovation and product development at AARP, on how he overcame his own preconceptions about his organization to spur innovations that are now improving millions of lives. Christian Lundblad, director of research for the Kenan Institute of Private Enterprise, with a macroeconomic view of the role of innovative entrepreneurship and intelligent risk-taking in addressing rising global inequality. Steve Lynch, vice president of workforce and economic development at Burning Glass Technologies, on how employees will need more advanced lifelong learning to be successful in the future. Martha Kanter, executive director of the College Promise campaign, and Jeff Strohl, director of research at Georgetown University’s Center on Education and the Workforce, on the importance of bringing the workplace and classroom closer together. Kelly Otter, dean of the School of Continuing Studies at Georgetown University and Alastair Fitzpayne, executive director of the Future of Work Initiative at The Aspen Institute, on the need for multiple “on-ramps” to educational opportunities. Maggie Koziol, a senior manager at Deloitte LLC, about the importance of involvement by the business community in providing training support and opportunities. Ted Zoller, director of the Entrepreneurship Center, a Kenan Institute-affiliated center, on the center’s work to reposition training to develop successful entrepreneurs. Greg Brown, executive director of the Kenan Institute, on the troublesome U.S. trajectory of flat labor growth and falling productivity and the stagnation of household income for the bottom 40 percent of households. Jeff Eggers of the McChrystal Group’s Leadership Institute, on the myths and realities of leadership. For a full list of upcoming Kenan Institute events, visit our website.